“THE MEDITATIONS” HEADLINES 11TH ANNUAL REGGAE CULTURE SALUTE | STREETS OF NEW YORK 411 INC. 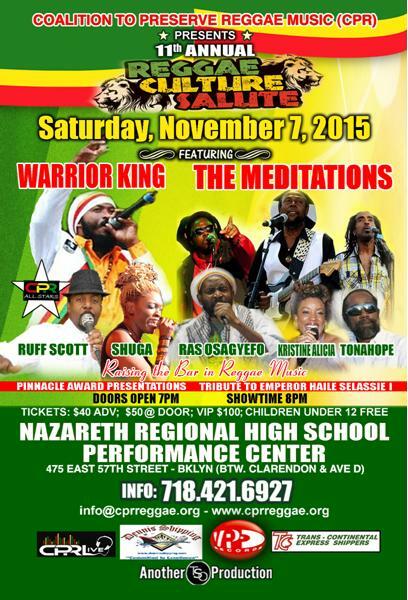 The Board of Directors of the Coalition to Preserve Reggae Music, Inc., (CPR) has announced the full lineup of artists to perform at the 11th annual Reggae Culture Salute on Saturday, November 7th at Nazareth Regional High School Performance Center, 475 East 57th Street, Brooklyn, New York from 8pm to 1am. The family friendly, multimedia presentation commemorates the anniversary of the coronation of His Imperial Majesty Emperor Haile Selassie I and Empress Mennen of Ethiopia and is the hallmark event of the Coalition to Preserve Reggae Music. The evening will highlight the organic relationship between reggae, Rasta, Emperor Selassie and Jamaica in a substantive way through a multimedia presentation that will engage the audience and raise awareness of the importance of this cultural phenomena to a people’s identity. This year, Reggae Culture Salute (RCS) is pleased to present The Meditations, a group which emerged in the mid 1970’s to carve out a prominent place in the annals of reggae music history. Founding member and lead singer for the group, Ansel Cridland today carries on the tradition that made the harmony trio a household name with hits like, the 1976 anthem, “Running From Jamaica” and the classic, “Woman is Like Shadow.” Ansel tours extensively now with harmonious support from singers Daddy Lion Chandel and Laury Webb who travel with him and his band of musicians as The Meditations. Returning to the stage at Reggae Culture Salute is Warrior King, who in 2009 left an indelible impression on the audience who were electrified by his high energy delivery. Warrior King’s penchant for music that celebrates women and advocates upliftment has garnered him worldwide acclaim as a rising star in the “reggaedom. The CPR Showcase which features CPR members each year is a highly anticipated part of the evening. This year, Easy Star front man, Ruff Scott will show case his special brand of “sing jaying” to lively up the evening. Making her Reggae Culture Salute debut will be Penthouse label’s Shuga, currently making waves with hits like, “Ebony” and “In Deh”. Also making debuts are Florida’s own Kristine Alicia whose big hit, “Freedom Fighters” has become an anthem in light of the #Blacklivesmatter campaign and Virginia’s own Tonahope, set to showcase his brand of roots, rock, reggae to the world. Backing will be provided by the CPR All Stars, directed by veteran guitarist Lenny Carby. CPR’s Poet Laurete, Ras Osagyefo will bring his bold banter to stir the soul and as always, traditional drumming and dancing will be in the mix, along with and lots of prizes and surprises for the family. Refreshments will include tasty Caribbean food and beverage and exhibitors as well as vendors of African arts and crafts will also be on hand. CPR’s internet channel, CPRLive will provide a live pay-per-view stream of the event. Proceeds from the event benefit CPR’s programs which include other performance presentations; the CPRLive internet channel with its music stream of predominantly roots reggae and live programs that provide information about the history and development of the genre and other community development matters; The CPR Artist and Repertoire Institute which offers education and training; free forums and other community development activities. Reggae Culture Salute is sponsored in part by VP Records, Dennis Shipping, Trans Continental Express Shippers and CPRLive.